This recipe appeared in Delicious magazine as a filling for tortillas. We found it was nicer without the tortillas. 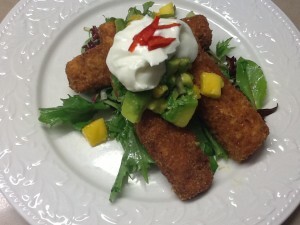 The fish sticks are rather like fish fingers for grown ups. 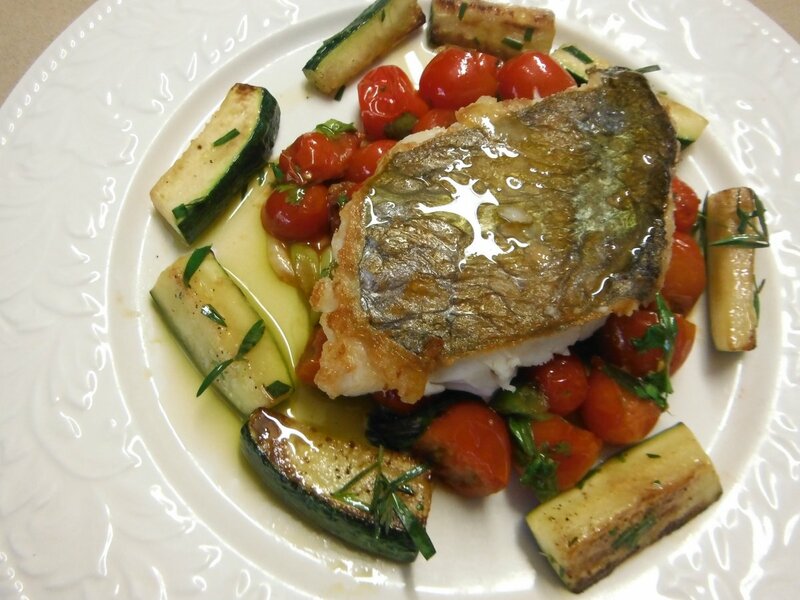 The recipe is easy to halve and if you don’t have a deep fat fryer you can cook the fish in the oven or in a frying pan. Make salsa by mixing all ingredients together. Cut fish into strips 1-2cm wide and 8cm long. You should have about 12 which is 3 per serving. Place flour, cumin, paprika and seasoning in one bowl, beaten eggs in another and breadcrumbs in a third. Coat fish in flour, then beaten egg, then breadcrumbs, patting on firmly. Chill for 15 minutes. Either cook the fish in deep fat oil in 2-3 batches for 4-5 mins or till cooked and crispy, then drain on paper towels. Or place on a baking sheet lined with baking paper, spray both sides with oil and bake in a hot oven at 200°C for 10-12 mins or until crisp and browned. Or pan fry. The ones in the photo were deep fried and got a little bit too brown. Mix salad with a little dressing and divide between four plates. Arrange fish pieces on top, then spoon over some salsa. If liked garnish with a dollop of yoghurt and a few slivers of fresh chilli.